As Usual We Have Made Upgrades & Improvements !!! When Hamer was a small privately owned company they manufactured many cool guitars that they discontinued in the 90's, when they went corporate. We took the basic cosmetics of this guitar and left them alone. We decided that we would stick with the exact scale of the Virtuoso but that's where we started. 2, We still offer the scalloped neck that was standard on the Virtuoso but we give you the option to only scallop part of the neck or not too scallop it at all. 3, Naturally we offer a full complement of pickup choices, bridge choices, fingerboard & body-wood choices unlike Hamer ever did. 4, The headstock shape on the original wasn't very complementary to the rest of the guitar. You can see our Headstock Page and choose any headstock you like absolutely free !!! Or design your own. 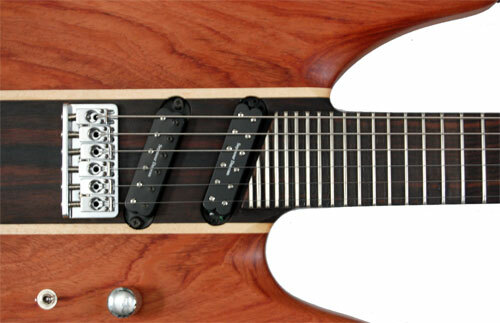 5, We also offer this guitar in 10 other body shapes !!!! Again you may design your own.